Rail is economical travel mode for Indian people. This time we present you latest offer that makes it even more economical. 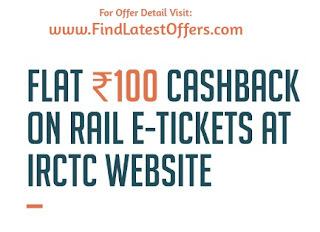 Next time you book Railway E-ticket, you will get Flat Rs. 100 Cashback. The entire invoice value has to be settled using Freecharge Wallet, partial payment not allowed. Thank you so much all your response on previous post of Get 2 Movie Tickets in less than Rs. 100. Subscribe by Email to get these type of awesome offers in your inbox.